The Saints Row iconic character Johnny Gat is making a return in Agents of Mayhem as the 13th agent and available through pre-order incentive (Gamestop or Steam). Voiced by Daniel Dae Kim, the character comes along with an exclusive unlock mission, personal mission and skins for him, his vehicle and weapons. Those who pre-order digitally will also get Lazarus, the half-woman, half-machine character. The game releases Augsut 15th. A bit more details along with the trailer and screens after the break. SEOUL – June 8, 2017 – He just couldn’t stay away. Saints Row fans love him, Saints Row fans want to be him, and now they can. 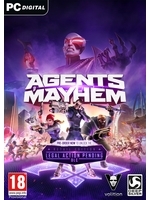 Agents of Mayhem is a single-player, open-world, third-person action game for the PS4, Xbox One, and PC gaming systems releasing on August 15th. For more information and to get the latest updates on the game, follow us on Twitter at @aomthegame or on Facebook at Facebook.com/aomthegame or visit aomthegame.com. SEOUL – June 8, 2017 – True to her half-machine heritage, digital pre-order purchasers of Agents of Mayhem will be receiving a brand new Agent, Lazarus. This exclusive character, Lazarus, is a merging of woman and machine; the top rung of the evolutionary ladder. As an agent of MAYHEM, she encounters an endless stream of competitors ready to challenge her for that distinction. While she’s evolved beyond her own humanity, she still has a great love and respect for humankind as a whole. MAYHEM allows her to watch over those quirky human beings whose flaws and peculiarities continue to fascinate her to this day.